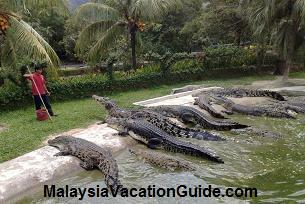 Kuah town, the biggest town in Langkawi is located at the southeastern tip of main island. It is the place where one can see a slightly heavier traffic as compared to beaches such as Pantai Kok or Pantai Cenang. Most importantly, it is the place where you can shop. Approximately 16 km from the Langkawi International, Kuah Town can be easily found with a 20-minute drive by following the road sign. It will be good to rent a car from the local agent as it will be more convenient for you to travel around the island. However, if driving is causing you hassle, you can always opt to make transport arrangement with the local agent or the hotel. Local travel agent such as Esteem Lane Travel & Tours Sdn Bhd and Langkawi Discovery Sdn Bhd do organize certain round island day tour where they will bring you to some places of interest in Langkawi. The many duty free shops at Kuah Town. Another brightly painted duty free shop. You will not miss it. At Kuah, you will realize that duty free shops are ubiquitous – almost everywhere along the street and it is indeed what makes the town attractive. Due to the act of waiving tax by the government, merchandises such as liquor, tobacco, chocolates and some imported kitchenware here are much cheaper than any other places. It is also a perfect place to grab some souvenirs for friends. Mostly, the duty free shops are located adjacent to each other. There are about 3 duty free shops located at the Jalan Pandak Mayah 5, Kuah Town. They are the Coco Valley Duty Free Supermarket, Zeno Duty Free Shopping Centre and the Onestop Duty free. Thus, take your time to check through the prices of merchandises in each store before making any purchase. Though products selling in these shops are similar – mostly liquor, chocolates, tobacco and some fast moving consumer goods, there might be differences in prices in each store. If you plan to purchase liquor, browse through all the adjacent shops and make comparisons. Try not to make your purchase decision in a hurry because there are always some shops that offer lower prices. Prices for hard liquor such as gin, vodka or Bacardi vary from RM 5 to RM 10. Same thing goes to chocolates as some store might have purchase-with-purchase or discount promotion for certain chocolates and might carry more variety of chocolates than others. Besides, it is also worthwhile to shop at the largest and modern shopping malls in Kuah Town – the Langkawi Parade Megamall located at Pokok Asam, Jalan Kelibang (near to the Grand Continental Hotel) and the Langkawi Fair Shopping Mall at Jalan Persiaran, adjacent to the jetty. These are the places where you can get more renowned brand such as Nike and Levi’s. The goodies at the many duty free shops that you can purchase for family and friends. However, do bear in mind that if you would like to purchase anything at the duty free shops, you must stay in Langkawi for at least 2 days (or being able to prove so). Before leaving the island with packets of duty free products, customs officers in the airport or jetty might request you to show official documents such as boarding pass, passport or receipts to prove that you have been staying in the island for more that 2 days. Besides, there are some limitations in liquor and tobacco where one visitor is only entitle to purchase one box of cigarette and one bottle of liquor (liquor must be hand-carried). Apart from numerous duty free shopping complexes, various hotels are also available in Kuah Town. Some of the recommended hotels in town are the Westin Langkawi which is near to the Langkawi Ferry Terminal, City Bayview Hotel and the Grand Continental Hotel. After a tiring day of shopping, treat yourself a great feast in the town as restaurants offering various cuisines, ranging from authentic Thai food to freshly caught seafood are available here!